DAYTONA BEACH, Fla. – Afroman is set to uplift the onlookers at Ocean Deck Restaurant and Beach Club, on Sept. 13. His Fla. set of concert dates will begin on Sept. 11 at Sports Page Live in Satellite Beach and end on Sept. 17 at Dixie Roadhouse in Cape Coral. He will also have an additional concert date on Oct. 9 at Manchester 65 in West Warwick, R.I.
Born Joseph Forman, Afroman remembered recording his first song and selling 400 copies. At the time, he was in eighth grade and it was about his teacher. She kicked him out of school, for violating the dress code and dawning saggy pants. He sold the tapes to students and staff members. He recalled them coming over to his house and commenting on the tape he sold to them. One microphone, tape deck and mixer was purchased by Afroman’s parents. It was to keep him out of trouble and he turned the end product into a hustle. He sold his tapes at swap meets, car shows and in Venice Beach, Calif. In 2001—his single, “Because I Got High”, was internationally known and it was certified gold in the country. It reached the Top 10 Singles Billboard chart and received a GRAMMY nomination. On Nov. 20—Afroman released his EP, “One Hit Wonder”. It was released through his own record label, Hungry Hustler Records/Fontana North. It included the song, “Because I Got High” (The Positive Remix). After the music video to the song was uploaded to Weedmaps TV, in Oct. It received over one million views, in two days. The original version of the song, “Because I Got High”, was a party song. The updated remix was to make a politic statement on the legalization of marijuana. Afroman joined forces with the National Organization for the Reform of Marijana Laws (NORML) and Weedmaps, to spread awareness of the positive effects marijuana hold. 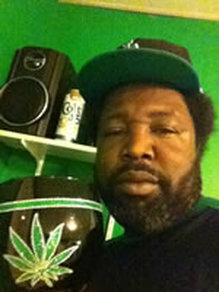 To visit Afroman’s official website, please click here. To “Like” him on Facebook, please click here. To follow him on Instagram, please click here. To follow him on Twitter, please click here. To subscribe to his channel on YouTube, please click here. Sept. 11 - Sports Page Live, Satellite Beach, Fla.
Sept. 12 - State Theatre, St. Petersburg, Fla.
Sept. 13 - Ocean Deck Restaurant and Beach Club, Daytona Beach, Fla.
Sept. 17 - Dixie Roadhouse, Cape Coral, Fla.
Oct. 09 - Manchester 65, West Warwick, R.I.